In a small bowl, combine cocoa and water and whisk to form a paste. Allow to cool to room temperature, then whisk in vanilla and eggs. In the bowl of a stand mixer fixed with the paddle attachment, mix flour, sugar, baking powder and salt. Add in butter and half of the chocolate mixture and mix on medium speed (#4 if using a stand mixer) for two minutes to “aerate” the batter. Scrape down the sides of the bowl and add the rest of the chocolate mixture in two batches, mixing on medium speed for 20 seconds each time. Pour batter into a lightly greased loaf pan, smoothing and flattening the top of the batter with a spatula. Lightly spread peanut butter on top of the batter and, using a sharp, thin knife, swirl the peanut butter into the batter. Don’t over-swirl, or you’ll lose the “swirly” top effect once the bread is baked. Bake bread for 50 to 60 minutes, covering the top loosely with lightly greased aluminum foil about 25 minutes into baking to prevent the top from over-browning. The bread is done when a toothpick inserted in the center comes out clean, and a thermometer inserted in the center reads about 200°F. Allow bread to cool in pan for 10 minutes, then completely on a cooling rack before slicing or serving. I like to express my affection for others through baking. After all, the way’s to a person’s heart is through his or her stomach, right? I find this is true almost all of the time (though I wouldn’t suggest serving your new significant other anything with too much garlic or too many beans, at least until you’re more comfortable with each other). One way I like to show people that I love them is by baking my absolute favorite recipes – and then giving them away. Trust me – if I’m giving away this Chocolate Peanut Butter Swirl Bread, which combines my two favorite flavors in the whole world, and don’t even sneak a bite from it, you know I care. This recipe is fantastic as an edible gift to a friend, neighbor, co-worker, spouse, whomever! You can bake one large loaf or in mini loaf form, wrap it up and send it away. And yes – you have to send it away (if you double the recipe though, you can keep a loaf for yourself!). You can even make them as muffins to share with a larger crowd – just be sure to lessen the baking time by about half and keep an eye on them. A toothpick inserted in the center that comes out clean is the tell-tale sign they’re done. I don’t know about you, but any time I try something with chocolate and peanut butter swirled together, it instantly brightens my mood. This bread is indulgent, sure, but it’s not too heavy or rich. 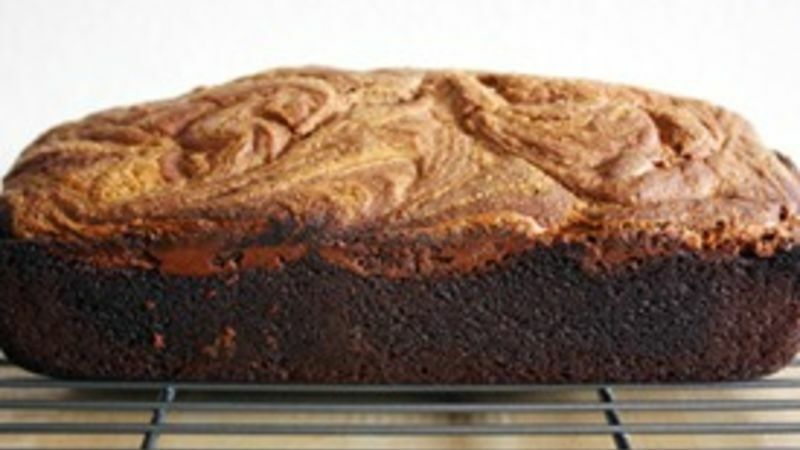 The chocolate is subtle, and the peanut butter swirl on top adds just a touch of extra sweetness, but nothing drastic. The next time you want to show someone how much you care, bake them this bread. You can fall in love with it together.